Your whole team can earn enhanced verifiable CPD with Dentaljuce, even if only one of you is a member, with in-house team training sessions that use Dentaljuce educational content to guide the meeting. Dentaljuce provides all participants in team training sessions with enhanced CPD Certificates conforming to the UK General Dental Council rules introduced in 2018. 1. Decide a topic, then book a time and date in your Practice Diary for the staff training session. This could be your regular staff meeting, or a special session of extra training, like a radiography refresher. At the start of the meeting, the Dentaljuce member signs in, and goes to e.g. the Radiography Module. The member is the official Course Organiser. 3. Use the Dentaljuce Q & A format to guide the meeting. Use the Dentaljuce Aims & Objectives, or create your own to structure the meeting. Invite discussion and questions from the group, and see if your answers agree with the Dentaljuce answers. 4. Print off the CPD Certificates. At the end of the session, the Course Organiser enters the session details, then downloads and prints off enhanced CPD certificates and associated paperwork for each participant. 5. Sign the certificates and invite feedback. The Course Organiser signs each certificate to confirm attendance. Use the pre-printed feedback forms that come with the certificates to ensure that the participants let you know how the session went. Have you just run a Team Training Course? Are you about to? Dentaljuce Team Training is ideal for all members of the team, in both small and large groups. Your CPD session can involve as few as two, or as many as 20 staff. • For Dental Foundation (DF1 and DF2) Trainers and Dentists: provides a robust portfolio record. • Induction for new staff: Cross Infection, IR(ME)R, Emergencies etc etc. • Refresher courses for the whole Practice. 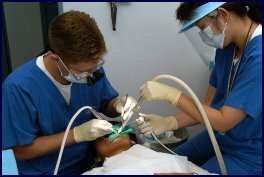 • Dentist-Nurse pairings to revise individual dental procedures. No computer in the staff room? Use dentaljuce on your phone or tablet to help you lead the meeting. To get the most from a Dentaljuce Team Training Course, we recommend that the Dentaljuce Member plans ahead by logging in to Dentaljuce and revising the topic to be covered. Add pages you want to use to your browser "Favourites". The Dentaljuce Team enhanced CPD Certificates include a Course Summary for the Practice Clinical Governance Portfolio, a copy for the Course Organiser, individual enhanced CPD certificates for all the participants, and course feedback forms.